Over the next month or two I will go into some detail on how a project evolves from design to installation. Each blog will cover a different stage. Some of the key stages in any project are as follows: So follow along as we go into more depth on these topics. Design: This could be from a designer, builder, home owner, cabinet maker or me. Estimating: Usually the first question asked by my clients! Colour and Finish: Colour is endless as well as the finished look. Sealer Choice: A wide range or sealers can make or break a project. Templating: Measure twice and cut once. 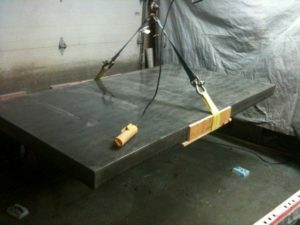 Forming: Making the forms to hold the concrete. Mix design: Will depend on the project. Reinforcing: Fibre, mesh, scrim, ladder wire, re-bar….. what to use when. Weighing out the mix: raw ingredients. Spray or Pour: GFRC over traditional wet cast. When to use which method. Curing process: Warm and wet wins the race. Wet processing: Acid wash to exposed aggregates. Slurry: filling in the void. Sealer: Choices are endless, but some stand out for good reason. Delivery day: transport and installation basics. These are the topics to be covered in this summer’s blogs. I hope you come back often and leave a comment or ask a question. I may not give out all my secrets, but at least you will know what goes into a project going out my door across the Threshold.